Climate Change has Nothing to do with the Sun? COMMENT: You are wrong. This chart proves you are wrong and it is mankind that is creating global warming. 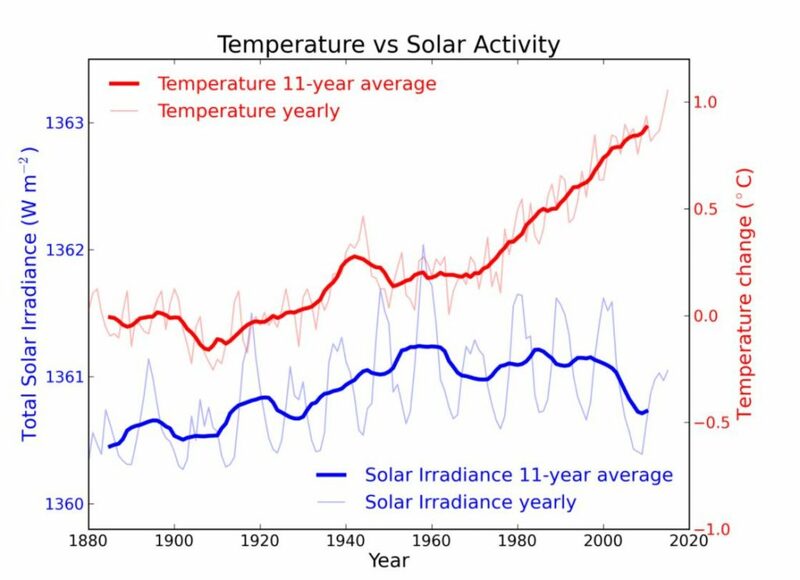 The sun activity has been declining for 35 years and the temperature is rising. That proves you are wrong. REPLY: First of all, the chart you rely on starts in 1880. The historical record is millions of years. Over 35,000 scientists have signed a letter stating Global Warming is fake. If I charted the Dow Jones for just the post-2009 period, I could conclude that the stock market only rises and never crashes. There is absolutely no empirical evidence whatsoever that proves Global Warming is caused by mankind when there have been warming periods and ice ages long before fossil fuels. It is one thing to say that our use of fossil fuels have “accelerated” the trend and something entirely different to argue that we have caused the trend. The ice core sample proves there is about a 300 years cycle between the maximum and minimum energy output of the sun. Looking at just 140 years of data does not prove anything. I am glad you trust the government so much that they argue this so they can tax it. Like cigarettes, if they are 100% bad, then outlaw them. Never! Why do that when they can tax them? If you want to argue the sun has nothing to do with this issue, then provide a study that goes back beyond 1880. If I am wrong, then perhaps all those who think they are the cause of the planet turning warm should walk to work, use no heat or air conditioning, purchase no clothes and make your own from sheep without consuming energy, or just commit suicide to stop breathing since you put out CO2 which you demonize as the planet killer. Even NASA has come out and admitted it is going to get colder – not warmer. NASA has reported that Antarctic sea ice (different from Artic ice) reached a new record maximum. Don’t worry, we are going into a cooling period and that is when empires fall. So be patient, you will reduce CO2, you just may contribute your part to help that along. « Global Warming Causing California Wildfires?